Baghdad (AFP) - France's defence minister warned Friday in Baghdad that "the work is not over" in the fight against the Islamic State group, despite the jihadists facing the loss of their last scrap of territory. "We must continue the fight against IS and terrorism in the region because IS is probably in the process of reorganising underground and spreading out." US-backed fighters in neighbouring Syria are gearing up for a final push to oust IS from the sole village it still holds, all that remains of a proto-state that once spanned swathes of both countries. President Donald Trump, who committed late last year to pulling US troops out of Syria, has said he expects a final declaration of victory over IS next week. 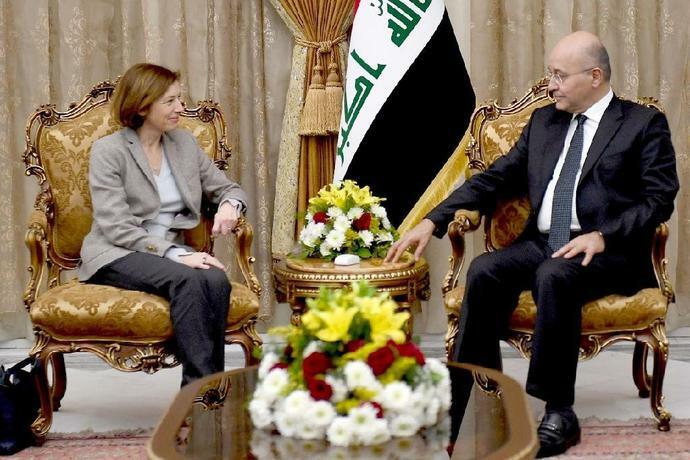 Parly called for France "to strengthen the relationship of cooperation and partnership with Iraq", both as part of a US-led coalition and bilaterally, to face the "persistent threat" of IS. Trump sparked the ire of Iraqi officials last week when he said he plans to keep American forces in their country to keep an eye on neighbouring Iran, also a major power-broker in Baghdad. Defence ministers from the anti-IS coalition, of which France is a central member, are set to meet soon to determine how it can maintain a regional "presence", Parly said.